I got the Dollar i717 Demonstrator fountain pen during a pen meet. One fountain pen lover had boxes of them and was giving them away months ago. I remember it was during the Mont Blanc sponsored pen meet because I had promptly filled the pen up with Mont Blanc Oyster Grey. I would like to pay it forward by giving away this pen. Details will be at the end of this review. The Dollar i717 Demonstrator is made by Dollar, a Pakistan based stationary company. They manufacture all manner of stationary. Among the fountain pens they make, the Dollar i717 Demonstrator is the only demonstrator model. I have found Hisnibs.com selling these pens at USD$15 each. This is extremely affordable for a piston filler fountain pen. The entire pen is made of plastic with blue finial and grip to accent the pen. It comes only in fine iridium point nibs. The Dollar i717 Demonstrator isn’t a large pen, it’s slim and lightweight. 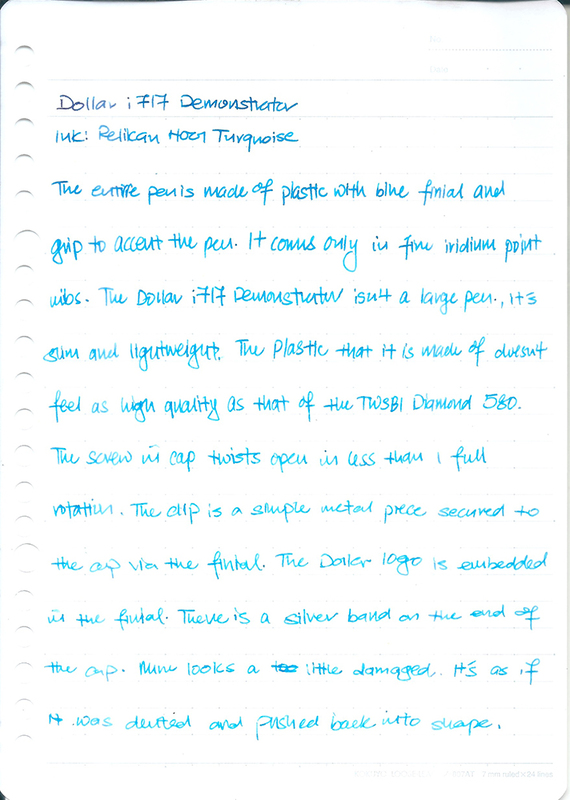 The plastic that it is made of doesn’t feel as high quality as that of the TWSBI Diamond 580. The screw in cap twists open in less than 1 full rotation. The clip is a simple metal piece secured to the cap via the finial. The Dollar logo is embedded in the finial of the pen. There is a silver band on the end of the cap. Mine is looks a little damaged. It’s as if it was dented and pushed back into shape before adding it to the cap. The grip section is smooth. It tapers slightly narrower towards the nib. The threads are smooth and doesn’t bite my fingers. The entire barrel is made of smooth and clear plastic. The piston mechanism is made entirely of clear or blue plastic. 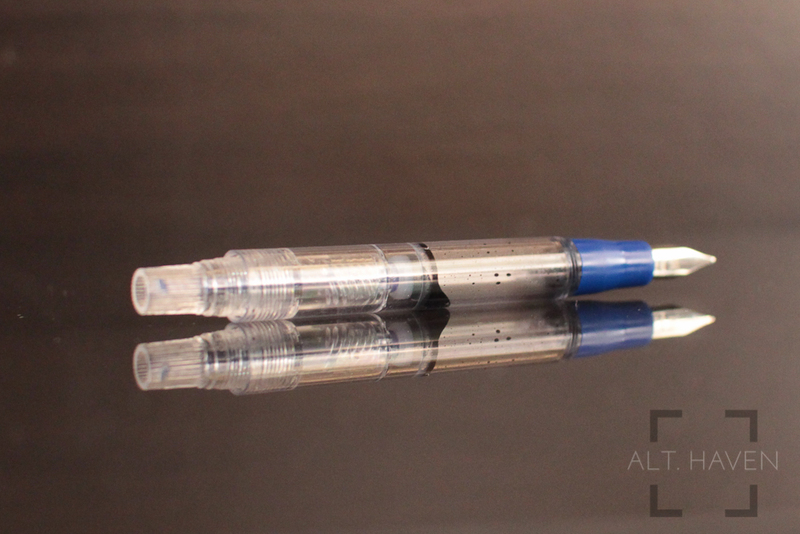 If you prefer to post your pens, the Dollar i717 Demonstrator can be posted without any worry. There is a blind cap at the end of the pen to prevent any accidental twisting of the piston knob. 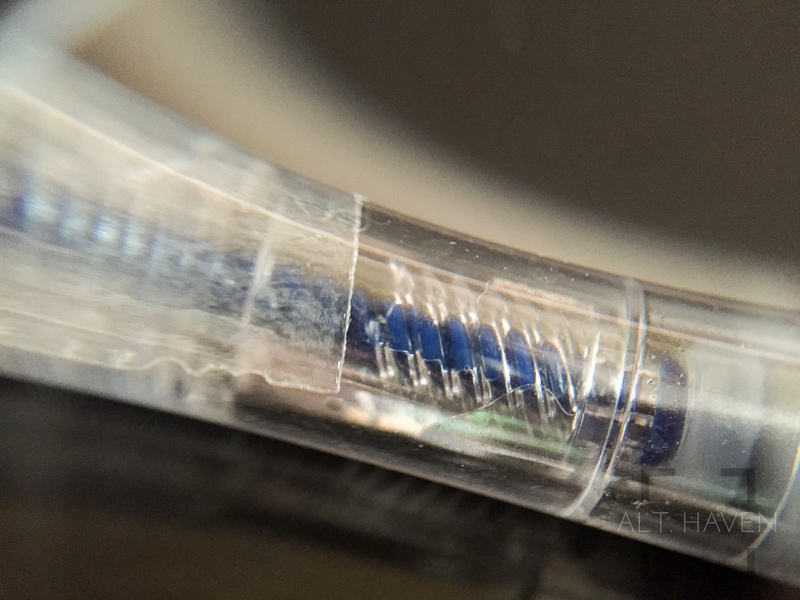 The nib of the Dollar i717 Demonstrator is relatively smooth and wet. It is a stainless steel nib with absolutely no give to it. This is a pen that doesn’t travel well. Getting jostle around in my bag on a motorcycle tend to get the ink splatter all over inside the cap and on the grip section. I had also encountered something odd when it was filled with Mont Blanc Oyster Grey. I was writing a letter to a pen pal when I realised that a drop of ink was forming between the nib and the feed. If I stop and tilt the pen nib up, the drop of ink would go back into the feed. If I continue writing after that, the drop of ink would form once again until it drops onto the paper. I had since washed the ink out and filled it with Pelikan 4001 Turquoise and so far there wasn’t anything similar thing happening. I suspect it might be a slow form of burping but I cannot be sure. Considering I got this pen for free, I can’t really say that the pen isn’t worth the money. This is a totally serviceable and value for money fountain pen. It writes well and would work well as a workhorse pen. However if you consider that TWSBI had since launched the ECO, I would personally had gone for that instead of the Dollar i717 Demonstrator if I was looking for an entry level piston filler. The build quality of the pen isn’t as good as TWSBI’s. I am also not sure if Dollar would stand behind their pen in terms of customer service the way TWSBI has done. Please drop me a comment below if you are interested in a chance to win this particular pen. If your comment is amusing it would be that much more enjoyable for me to read. This giveaway is open for both local and international readers. This giveaway will end 17th December and I would announce the winner on the blog. The winner has one week to claim his/her prize. Otherwise I would do another random drawing to pick another winner.